Sparkly Fashion: Would you like a slice of Watermelon? Would you like a slice of Watermelon? Hi lovelies! How's life? I should have published yesterday but I was busy so here it is my new Outfit post :) This is a really casual and comfortable Summer look with a funny top, denim shorts and flat sandals. I'm sure that after reading this post you will get the desire of eating a slice of watermelon, I don't know about you but I love eating watermelon in Summer (yes, you can eat it only in Summer XD), it' so fresh and delicious! The other thing I love about this look is this Tosca Blu bag with apples on it, I find it really funny too, perfect for this "not so serious " outfit; do you like it? Let me know your opinions, leave me a comment, I'm always happy to read your comments either positive or negative they are, constructive criticism is always useful (bad words are not useful). Buongiorno! Come va? Avrei dovuto pubblicare ieri ma sono stata impegnata, quindi eccomi il mio nuovo post outfit anche se un pò in ritardo :) Questo che vi mostro è un look estivo molto casual e comodo il cui protagonista è questo divertente top abbinato a semplici shorts in denim e sandali bassi. Sono sicura che dopo aver letto questo post correrete verso il frigorifero ad acchiappare una fetta di anguria; non so voi ma io amo mangiare l'anguria d'Estate (si, in effetti si può mangiare solo d'Estate XD), è così deliziosa e rinfrescante! Un' altra cosa che amo di questo look è sicuramente questa simpatica borsa Tosca Blu con le mele, perfetta per questo look "davvero poco serio"; vi piace? Fatemi sapere le vostre opinioni! Lasciatemi un commento, sono sempre contenta di leggerli, positivi o negativi che siano, le critiche costruttive sono sempre utili (gli insulti gratuiti non lo sono). adoro questo look così estivo cara!! I would LOVE a slice of melon please-your right watermelons are best enjoyed in the Summer. Really cool top. great look!the top is so cute! hmmm ke voglia d'anguria :))! molto molto carino questo outfit ;)! Such a funny apple bag! And indeed, that watermelon looks delicious haha. Of course....I love watermelon in any case. Lovely look. Hi Giulia! 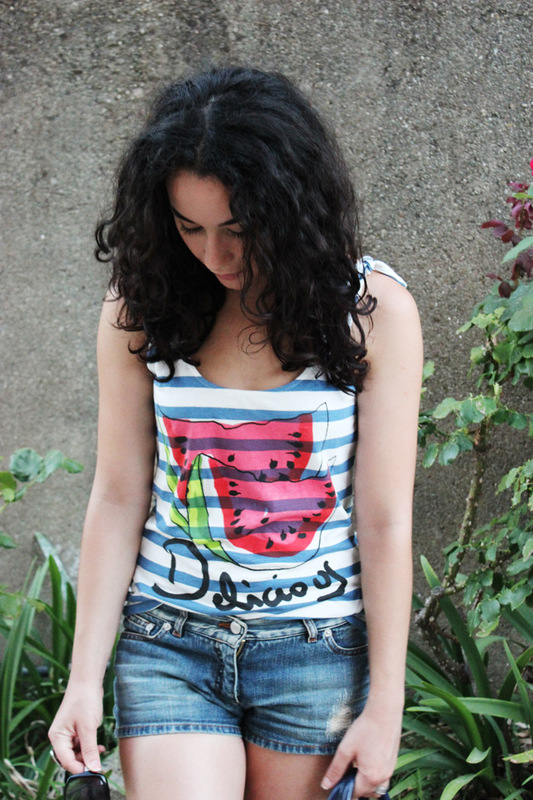 I´ll reply to you here, I am now following you also.. :) AND I just bought a watermelon. Funny! Really like your blog and outfits! Cute shirt! It looks great with your shorts. We love it! Hi! I just found your blog and love it :) The top you wearing is so cute and perfect for Summer fun! I'd love to visit Sicily one day - my bf is desperate to go. Would you recommend it being your hometown? ouuuuuu! Thanks!! Your look is amazing too!! Love your blog! I follow you! it´s cool i like so much what i find here every time! I agree, watermelon is the BEST summer fruit - so refreshing, and it makes a great accessory too ;) Looking cute!